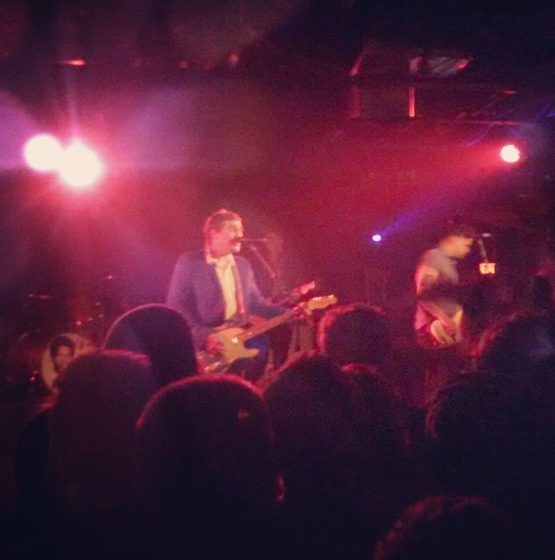 Concert Review–The Gaslight Anthem, Upstate Concert Hall, 6/19/14 | Geeking out about a lot of things. 2014 should be a good year for The Gaslight Anthem, the alternative rock band straight out of New Jersey. They have a new album, called Get Hurt, coming out in August, as well as a world tour to promote it. Formed in 2006, they have been called a lot of things, from punk-rockers to Springsteen-wannabes. Over the course of four albums, they’ve really begun to find their niche though. The Gaslight Anthem specializes in music that conveys a sense of idealized romanticism and nostalgia, all while speaking to the working class every-man. It’s hard to not be a Gaslight fan without getting emotionally attached to the music. The Gaslight Anthem have become regulars at Upstate Concert Hall in Clifton Park, NY, with annual stops there for the past three years. Their stop last year came a day after front man Brian Fallon wrote a heartfelt blog post pleading to fans to accept the band for who and what they are despite their musical influences (Springsteen especially). It was a call to be seen independently from those influences, and the show that followed at Upstate could be described as “moody.” Fallon wore sunglasses the entire time, hardly bantered with the enthusiastic audience, and band members mostly stayed in their respective places, trudging through the playlist. This year’s performance was a complete 180 from last year’s show. After the audience was left with an energetic set from openers White Denim (give them a listen if you haven’t), Gaslight took the stage with their hit “The ’59 Sound.” The energy was very high, and the tone was set for the rest of the evening. After performances of “Handwritten,” “Old White Lincoln,” and “45,” I found myself realizing that it seemed like it was an entirely different band playing than had showed up there the previous year. Fallon took many opportunities to banter with the audience and fool around with band members on stage. One of the funniest moments came when Fallon made touring guitarist Ian Perkins talk into the microphone, claiming that Perkins doesn’t talk much. After Perkins said literally a couple words, Fallon told the audience to cheer, as they were witnessing a rare occurrence. The set list was heaviest on material from their (arguably best) album “The ’59 Sound,” and their performance of “High Lonesome” was the best of the evening. Other highlights included an extended instrumental at the end of “Too Much Blood” and their cover of “House of the Rising Sun.” Fallon stated that while new material was coming, the point of this show was to play some songs they “haven’t played in a while” and to play what “people wanted to hear.” Based on the audience’s reaction, these were, in fact, the songs people were dying to hear. The set list is somewhat similar to the set list from last year’s Upstate show, with material from all 4 of their albums, but like previously stated, it seemed as if an entirely different band was playing. The Gaslight Anthem playing at Upstate Concert Hall in 2014 was a band of confidence, excitement, humor and fun, and I hope to see this kind of energy on their upcoming album. While I would have loved to have heard new material, the show reminded me why I love The Gaslight Anthem in the first place. Looking at the screaming fans around me, I sensed a similar attitude among them as well.